It was a fast couple of days. Very fast, in fact. Light but steady mid-Atlantic winds ruffled the waters in Baltimore Harbor, making conditions perfect for testing Yamaha’s newest outboards, particularly the new F350C powerhouse, the next generation of Yamaha’s first-ever 5.3-liter, V8 four-stroke offshore outboard. With its variable camshaft timing and class-leading displacement, the F350C produces exceptional power and torque in the low- and mid-range rpm applications, perfect for today’s big, bluewater fishing boats. 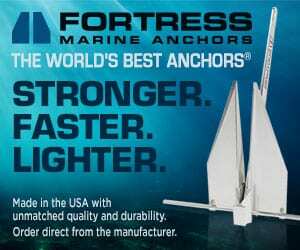 If you own a large, offshore-capable center console, you naturally want that level of performance to move the family-pleasing, fish-conquering designs that are growing in popularity. On the docks in Baltimore, twin F350C Yamaha outboards mounted on a new Everglades 325 Center Console provided our first look at what this advanced power plant offers. 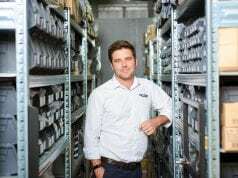 Everglades Director of Dealer Development Shane Kwaterski had us on plane in seconds, and I watched closely as the tachometer climbed past 2,500 rpm. At 3,500 rpm, the 32′ 4″ LOA, 10′ 8″ beam, 11,510-lb. (dry weight with twin Yamaha 350C outboards) center console exceeded 29 mph, burning 21.5 gph for a best-efficiency rating of 1.37 mpg. Yamaha’s powerful F350C is the world’s first 5.3-liter V8 four-stroke outboard. But Kwaterski was just beginning, and as he advanced the throttles to their stops, we watched the 325CC top out at a head-clearing 56 mph, turning 6,000 rpm and burning 67.9 gph. Interestingly, the speed range efficiency readings most prized by owners varied from the aforementioned 1.37 mpg at 29 mph to 1.04 mpg at 45 mph—a broad performance spectrum with a relatively slight loss of overall efficiency for the F350C twins. There was one other boat rigged with the F350C available for testing, a Shearwater 27 Carolina center console. Equipped with a single motor, this 26′ 10″ LOA, 8′ 6″ beam bay boat with a shoal-friendly 15-inch draft was on plane in 5 seconds and turned a top speed of 60 mph at 6,100 rpm. 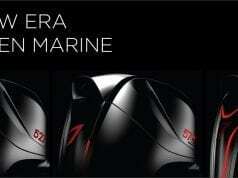 This boat produced best economy with 2.6 mpg at 37 mph and 4,000 rpm and burned 14.5 gph. 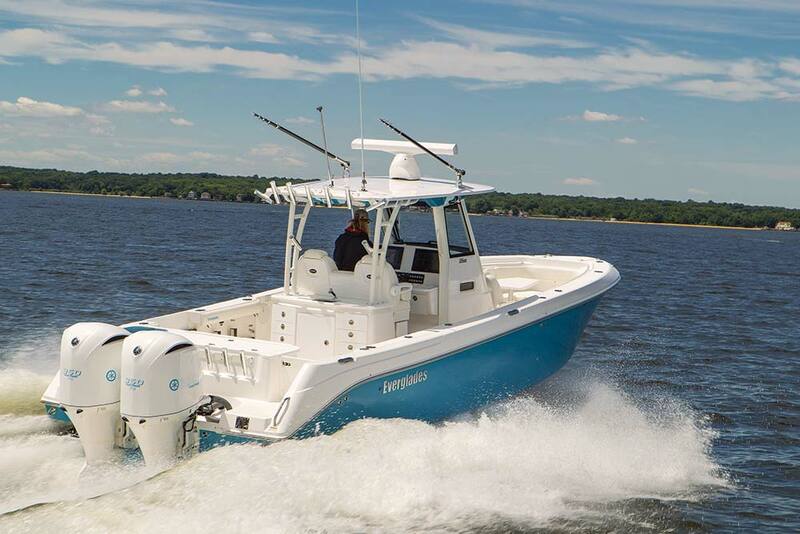 Like the above Everglades center console, the Shearwater achieved over 2 mpg across a wide range of operating speeds, beginning at 27 mph and 3,500 rpm and extending through 49 mph at 5,000 rpm. When pushed to 5,500 rpm, the efficiency barely dropped from just above 2 mpg to 1.9 mpg. Yamaha’s F350C is the latest generation of the 5.3-liter, double overhead camshaft (DOHC), 60-degree V8 introduced in 2007 as the next advancement for large, open-water-capable center consoles, among other kinds of designs. This engine provided, and continues to provide in its newest iteration, up to 45 percent more thrust than Yamaha’s legendary 250-hp engine, using features such as sequential multiport fuel injectors for precise fuel metering. It also utilizes a single, electronic throttle control valve actuated by the electronic control module (ECM) for air induction, plus its long pulse-tuned intakes and dual exhausts provide the best flow of fresh and exhausted air charges. To handle its high output and torque, Yamaha specified strong forged internal motor mounts and an oversized motor bracket, both of which help to mitigate vibration and noise. The manufacturer also developed what they term the “Ultra-Tough Gearcase” and equipped it with hardened, high-strength oversized bearings and bearing surfaces. 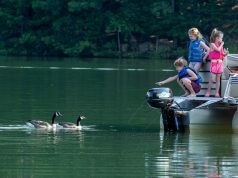 Aside from the F350C, Yamaha continues to offer a variety of new engines for other boating applications and preferences. Four new V MAX SHO outboards—all of which are compact, lightweight and capable of performance typically associated with two strokes—showcased four-stroke convenience, fuel efficiency and quiet operation. The new V MAX SHO 115, aimed at smaller boats like the Ranger RP190, and the new V MAX SHO 175, aimed at midsize boats like the Veranda Vertex 22RFL pontoon, rounded out the horsepower offerings of the V MAX SHO family, which already includes V MAX SHO 150, 200, 225, and 250 models. Interestingly, the new V MAX SHO 150 X-Shaft and V MAX SHO 250 X-Shaft are the first members of the V MAX SHO family to feature a 25-inch shaft length, making them ideal for boats with large transoms. 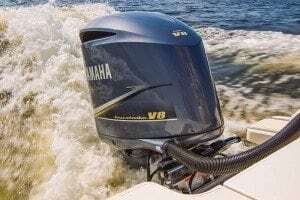 Some of you will remember 1986 as the year Yamaha Marine entered the U.S. boating market with a full line of advanced, stainless steel-enhanced outboard motors. I remember it well because that introduction took place in Baltimore. 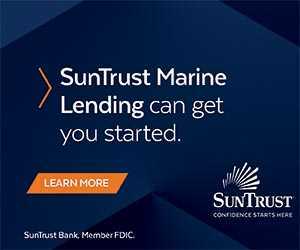 It launched an intense, competitive engineering-based outboard race that continues to this day, bringing more reliability, efficiency and performance to boaters of all stripes. It was great to come full circle by returning to Baltimore to see what’s new from Yamaha for 2016.